The Navajo Community Planners, Inc is requesting qualified applicants to apply for the open seats in the upcoming Annual Election for the Navajo Community Planning Group. 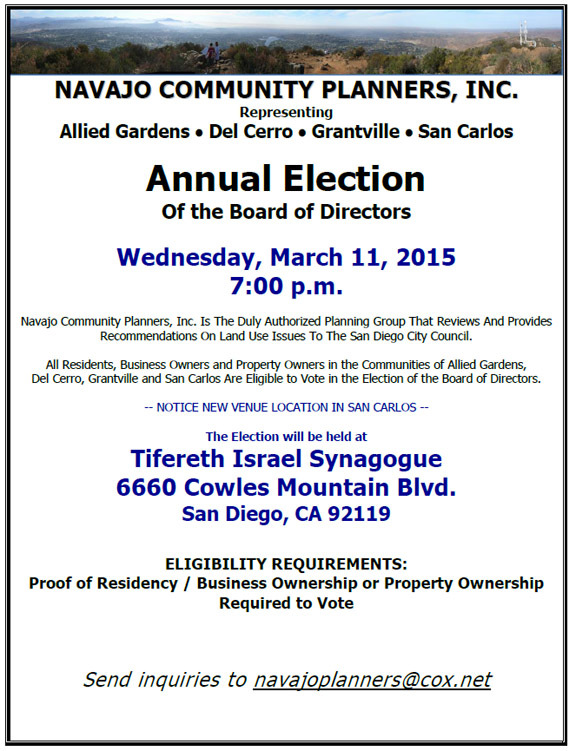 The election will be held 7:00pm, Wednesday, March 11, 2015 at Tifereth Israel Synagogue, 6660 Cowles Mountain Blvd., San Diego, CA 92119. In order to be a candidate for this open seat, an eligible member of the Navajo community must have attended two (2) meetings of the NCPl during the last 10 months (prior to the Election Date) which can be documented. A completed application must be filled out and submitted by 12 Noon, Monday, March 9, 2015 in order for the applicant’s name to be placed on the ballot. If you would like be a candidate for this board position please complete this application form. The application may be submitted by the due date to navajoplanners@cox.net.